Compact, light and moderately powered 22W all-tube combo amplifier that honours the classic look and great sound of ‘60s amps and is a perfect companion for guitarist with an eye and ear for late-’60s Fender “silverface” style. This model received a fresh new face in 1968 – a silver-and-turquoise front panel with aluminium grille cloth trim, with tone, reverb and tremolo that was still pure Fender. It also has modified all-tube circuitry with 6 preamp tubers, two power tubes and one rectifier tube and hand-wired tube sockets, Vintage channel for traditional silverface tone, Custom channel with Bassman tone stack, and reduced negative feedback for greater touch sensitivity and quicker gain onset. The combo also provides Fender tuber-driven spring reverb for wet, shimmering ambient sound ranging from subtle to cavernous, and rich, pulsating tremolo. It is equipped with a 12” Celestion G12V-70 speaker (8 Ohm), independent Volume, Bass and Treble controls for each channel, plus Reverb, Vibrato: Speed and Intensity controls for Vintage channel. The combo provides four 6.3mm inputs (two for each channel) and two 6.3mm parallel speaker jacks. Birch/pine enclosure features a black texture vinyl covering and a moulded plastic strap with nickel-plated caps. A two-button (Reverb on/off, Vibrato on/off) footswitch pedal is included. Dimensions: 445 x 241.3 x 622 mm. Weight: 19.05 kg. 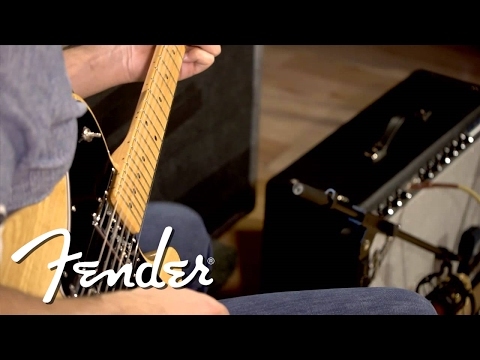 Do you own Fender 68 Custom deluxe reverb or have you had a chance to try it?